You will need to use the correct browser for your computer’s operating system (see the "Which browser should I use? "section below). You will also need to check to make sure that your computer has the necessary software, plug-ins, and updates by running the "First Time User" tool (see the "Steps for First Time Users" section below). 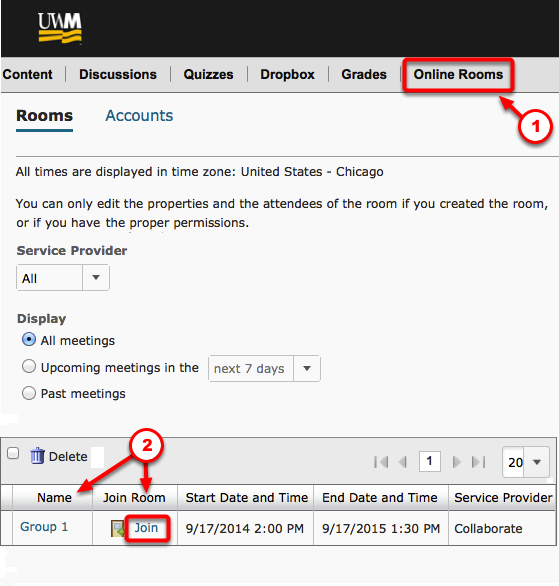 In addition, you will need the Blackboard Collaborate Launcher to successfully access Online Rooms. Below you will find instructions for using a Mac (see the "For MAC – Using the Blackboard Collaborate Launcher" section below) and a PC (see the "For PC – Using the Blackboard Collaborate Launcher" section below). You can troubleshoot the issue (see the "Troubleshooting" section below). Contact Blackboard Collaborate Support 24/7/365 (see the "Technical Support" section below). Step #1 – Which browser should I use? Blackboard Collaborate works better on some browsers than others. The browser supported by the most operating systems is Firefox: https://www.mozilla.org/en-US/firefox/channel/#firefox/firefox-desktop. In order to enter an Online Room, you’ll need to login to D2L (http://d2l.uwm.edu/) and enter the course site for your class. You should see a link for [Online Rooms] in the top navigation bar of your site. Click to go to [Online Room]. Identify the Online room you are to use, as directed by your instructor. Click [Join] to enter the Online Room. When you click the link to enter your Online Room in D2L, Blackboard Collaborate checks to see if you have the launcher installed and, if you don’t, prompts you to download it. The Blackboard Collaborate Launcher is a utility for Windows and Mac that provides a convenient and reliable way for you to launch your Blackboard Collaborate web conferencing sessions and recordings. Installing the Mac Launcher: https://help.blackboard.com/en-us/Learn/Building_Blocks/Blackboard_Collaborate/zReference/Blackboard_Collaborate_Launcher/20_Launch_Blackboard_Collaborate_from_Mac/10_Install_the_Launcher_on_Mac Note: the screen shots may look a little different in Step 1 and Step 2 of this tutorial. However, the words of the prompt should be the same. For example, [download the Blackboard Collaborate Launcher] or [Download]. Opening .collab Files Automatically on Mac: https://help.blackboard.com/en-us/Learn/Building_Blocks/Blackboard_Collaborate/zReference/Blackboard_Collaborate_Launcher/20_Launch_Blackboard_Collaborate_from_Mac/40_Open_.collab_Files_Automatically_on_Mac Note: This step will allow you to enter Blackboard Collaborate sessions AUTOMATICALLY (without installing the Launcher or opening the .collab file with the Launcher application). It is highly recommended that you complete this step to make future Online Room visits easier. If you are unable to launch Blackboard Collaborate with your .collab file, typically, either your operating system does not know what application to use to open this file, you have not installed the launcher or there was a problem when you installed the launcher.